Jaroslav Wieczorkiewicz, who was recently in the middle of a controversy with his campaign for Coca Cola’s new milk product, is back making a super splash with his 2015 Splash Heroes calendar. Wieczokiewicz has been getting a lot of well-deserved attention for his Photoshop composites where he “dresses” the models in various shades of colored milk. In Jaroslav’s latest collection, he has really stepped it up from the monochrome white milk dresses of the Coca Cola campaign to his latest Splash Heroes calendar where he used different pigments in the milk to create a series of costumes for his super heroines. The results are amazing. Wieczorkiewicz chooses to splash the milk on the models while his assistant takes the photos. He says it takes up to 200 photos to composite into each image. He has a special and precise technique to his milk throwing that he likens to the subtlety of playing golf—he makes it look easy. 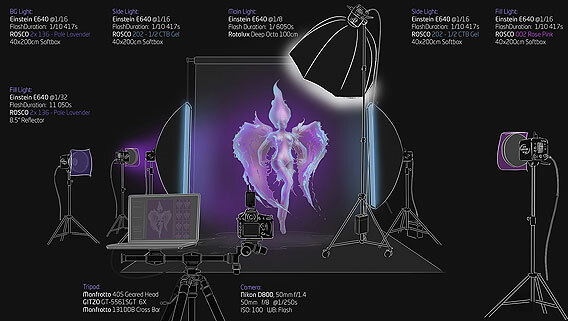 If you think this is a project or idea you’d like to try, you can see one of his light setups here and his BTS video of the making of the project on his website www.aurumlight.com. We look forward to seeing your interpretation of Wieczokiewicz’s techniques. © 2014 Copyright ShootTheCenterfold.com. All rights reserved.